Calgary is a beautiful destination with stunning surroundings and epic sights to see. It's a match made in heaven for nature lovers and is the perfect location to have as your base for day trips for this reason. From the historical Blackfoot Crossing to the stunning Moraine Lake, you are spoilt for choice when it comes to road tripping around here. Looking to hire are car? VroomVroomVroom have got you covered when it comes to your Calgary adventures. If you are visiting Calgary or are a local, these are the top day trips you need to go on. Directions: Get on Deerfoot Trail/AB-2 N and then follow the Trans Canada Highway East for an hour. Continue on AB-842 S.
Top Attractions: Stunning views and scenery, tours of the exhibits and of the valley itself, Tipi Village. This crossing is an important part of Canadian history because this is where Treaty 7 was signed between the Canadian government and the Native Nations. When you visit here, you will be able to have an authentic Indigenous experience. Blackfoot Crossing is a tourist attraction located on the Siksika Nation reserve. 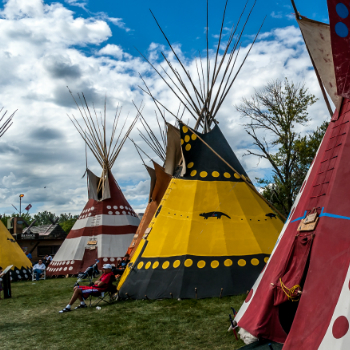 This historical tourist attraction is not only beautiful to see and visit but is also the perfect way to explore the history or the Siksika nation. This day trip is perfect because it combines two elements, epic scenery and the opportunity to learn about the culture and history of this breathtaking location. It's great to learn about the history for both kids and adults and is a quick little road trip pretty close to Calgary. Travel time: 1 hour 25 minutes. Directions: Get on Deerfoot Trail/AB-2 N, follow Deerfoot Trail/AB-2 North to AB-566 E/TWP 262 E in Rocky View County. Take exit 275 from Deerfoot Trail/AB-2 N, Turn right onto AB-566 E/TWP 262 E, Drive to 2 St W/AB-56 N/AB-9 E in Drumheller. Top Attractions: Horseshoe Canyon, Royal Tyrrell Museum of Paleontology, Dinosaur Trail, Badlands, Atlas Coal Mine National Historic Site, Dinosaur Provincial Park. Aside from the amazing fact that Drumheller is the Dinosaur capital of world, this location is scenically beautiful. The Canadian Badlands are a must visit. 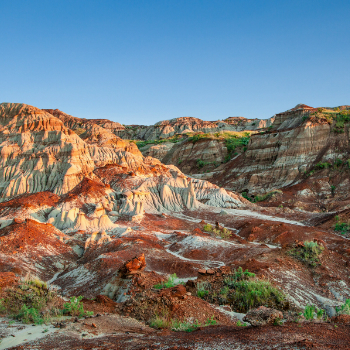 We recommend going on the Hoodoos Trail and Drumheller's Pathways for the best hikes. Did you know that over 20 dinosaurs were discovered here? Well, you can walk around the town and learn about the history of this uber cool place. It's the perfect location to take kids but also is great for couples as well. That's why it's such a great road trip destination - no matter you age or what you are interested in, there is something for everyone. Travel time: 2 hours 12 minutes. Directions: Get on Trans-Canada Hwy/AB-1 W from 6 Ave SW, Bow Trail SW and Sarcee Trail SW. Follow Trans-Canada Hwy/AB-1 W to Bow Valley Pkwy/Whitehorn Rd/AB-1A W in Improvement District No. 9. Take the Bow Valley Parkway exit from Trans-Canada Hwy/AB-1 W. Drive to Moraine Lake Rd. Top Attractions: Hiking around the lake, canoeing, gorgeous scenery. 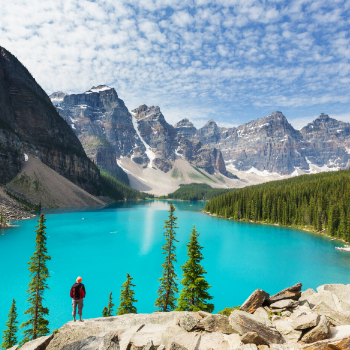 Moraine Lake isn't your ordinary type of lake - it's a glacially fed lake, located in the Valley of the Ten Peaks. When you visit here you will notice that the water here is a stunning turquoise colour because of the near by glacier. With the ice-capped mountains, lush green forest and blue water, you will be in awe of it's scenery. You won't be disappointed by these views especially since they are so beautiful they were featured on the Canadian twenty dollar bill in 1969. They have also featured as backgrounds for Google and Windows, how cool! Aside from that, the hikes here are amazing and there are many different options for every skill level.